Apologies for the late post today. 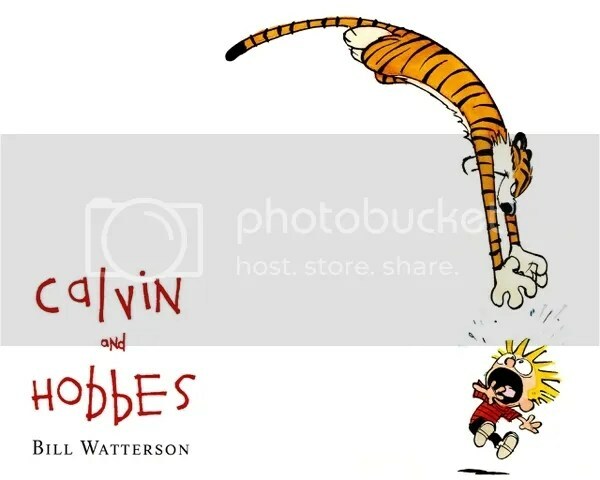 Photobucket is having major upload/delete issues, and I am not getting any useful feedback from them! Well, that, and…Christmas! 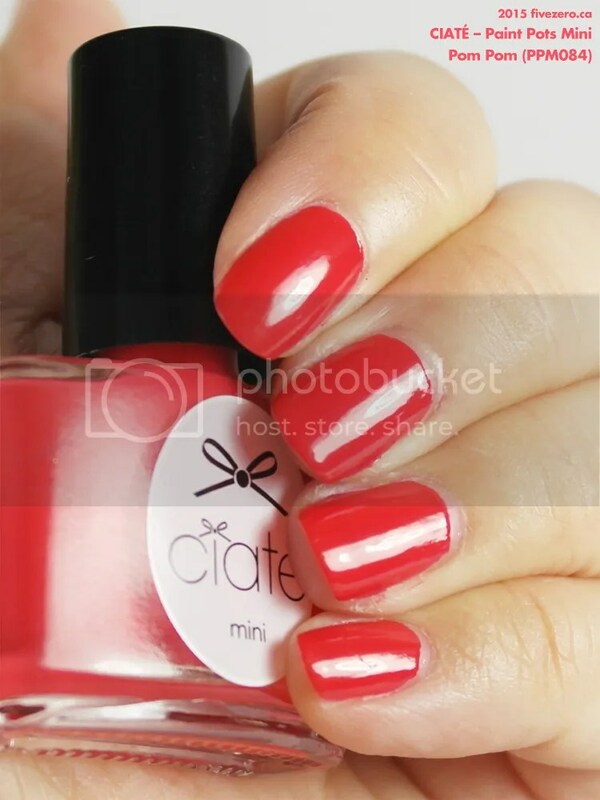 I received the Ciaté Mini Mani Month Advent Calendar as a gift last month, and I meant to post about it by the week in December, but obviously things have gotten too hectic! So, now I’m in a rush to get these babies all swatched up before Christmas is actually upon us! It’s just crazy how as a kid, I got so excited for Christmas, and it seemed like a week would go by like a whole year. Now, as an adult and having to prepare Christmas for the family (who can be a little ungrateful at times, or is it just me? Ha! I kid. Mostly it’s just the peanut batting at ornaments when he knows he’s not supposed to…), it seems like Christmas sneaks up and jumps on me before I even realize it’s not November anymore. Here we are in the middle of December, nine days from Christmas, and instead of cleaning house, preparing Christmas Eve and Christmas Day meals, buying booze, and enjoying time with the family, I’m furiously swatching Ciatés for the blog! 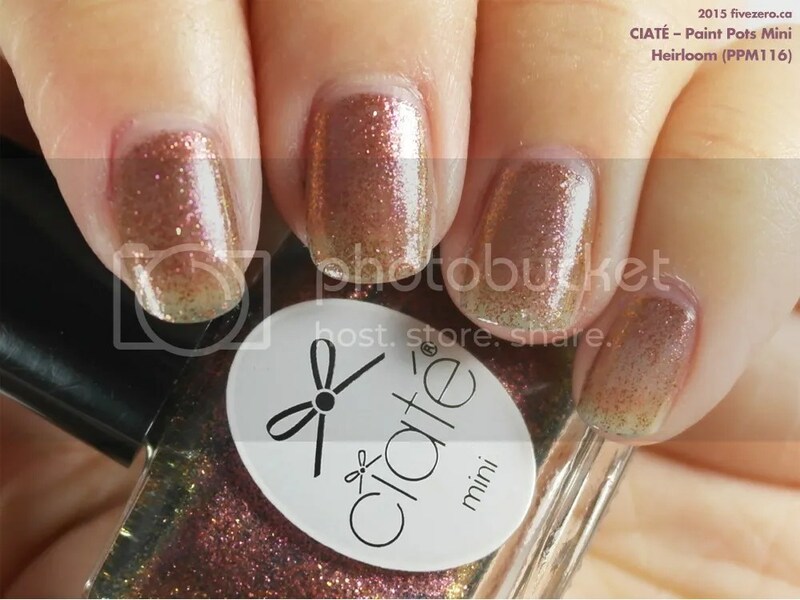 As an overall note, these are all Ciaté mini bottles (there is one full-sized bottle in the Advent Calendar, but it’s reserved for the 24th), which hold 5 mL. The brush is a proper, full-sized brush: slightly thick and flat, and easy to handle. 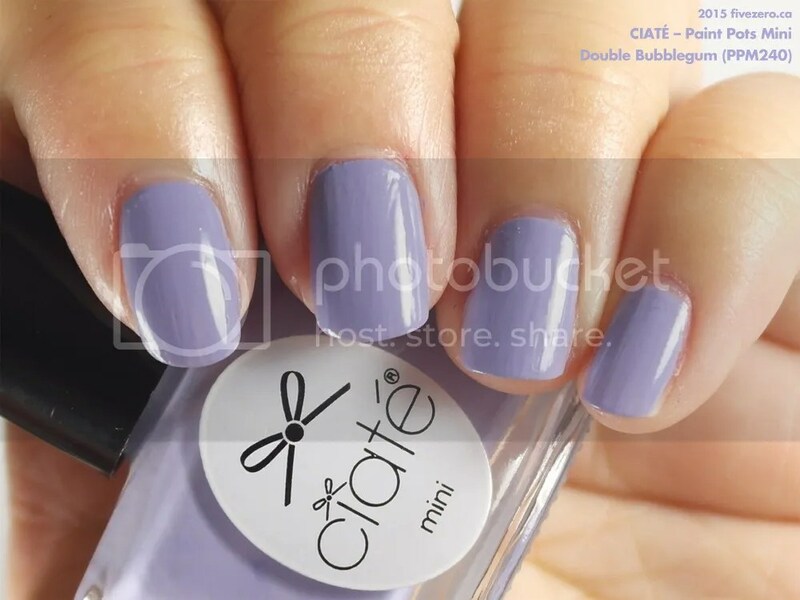 Ciaté definitely makes one of the nicer mini bottles! 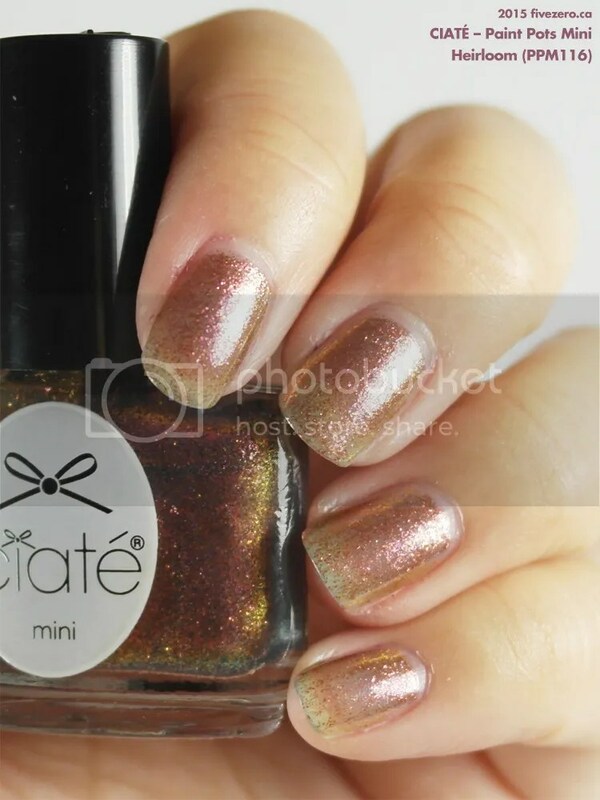 Stunning in the bottle: a fine glitter with raspberry plum, antique gold, and a splash of deep bottle green iridescence. On the nail, it’s desperately sheer and needs at least three coats to get a bit of color on. This is probably awesome layered over a deeper shade; I’ll have to try it over black! This would have been my hands down favorite, but it’s kind of a fail. 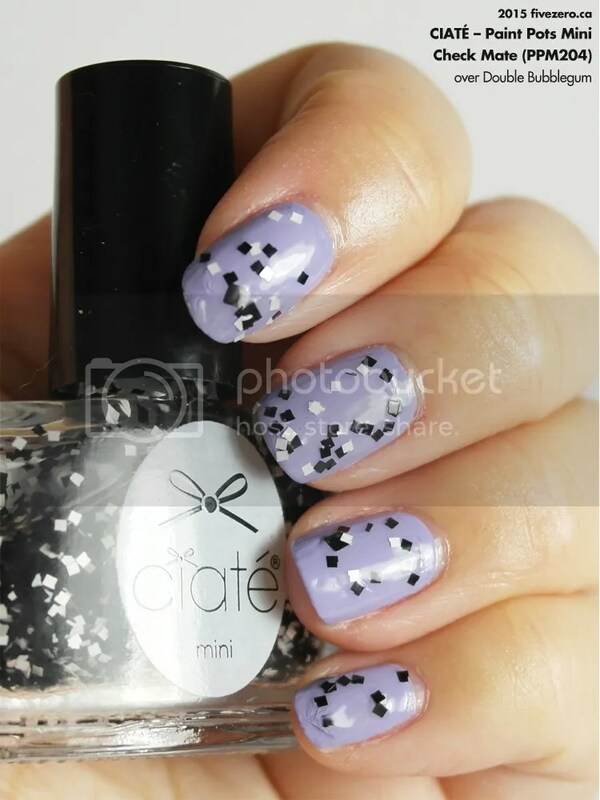 This top coat consists of black and white confetti squares, and I love the look! But, it’s really too sparse. My first coat for each nail ranged from one or two confetti squares to none at all. Just a sheer coat. I did three or four coats for the swatch, and that’s on top of three coats of Double Bubblegum. No thank you! It’s a total shame, because I really, really dig this one in the bottle. I guess if I had taken my time, I could have spread out the confetti more evenly, and then it would look OK, but I’m in a bit of a rush with my swatches, here! This is a glorious, vivid warm poppy red that can lean a little pink or a little orange, depending on the light. 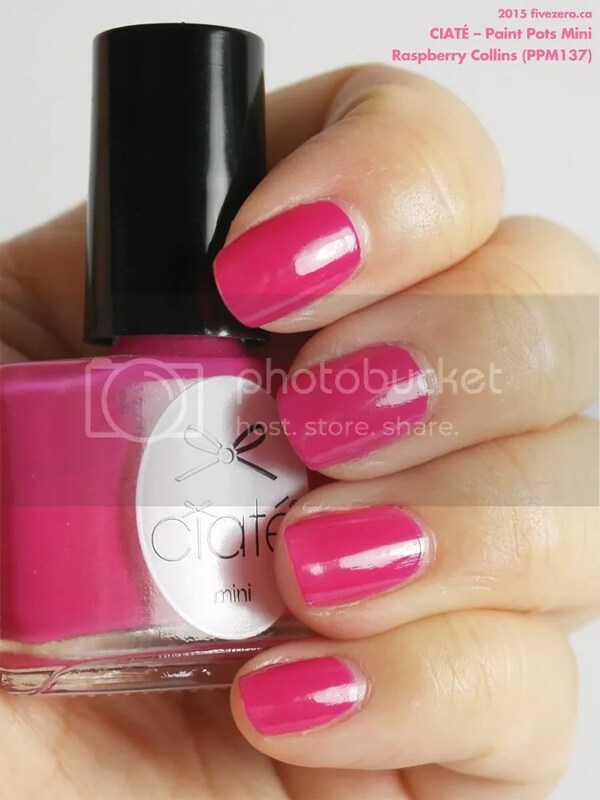 Two coats apply very easily and give full opacity. Top marks for this one. 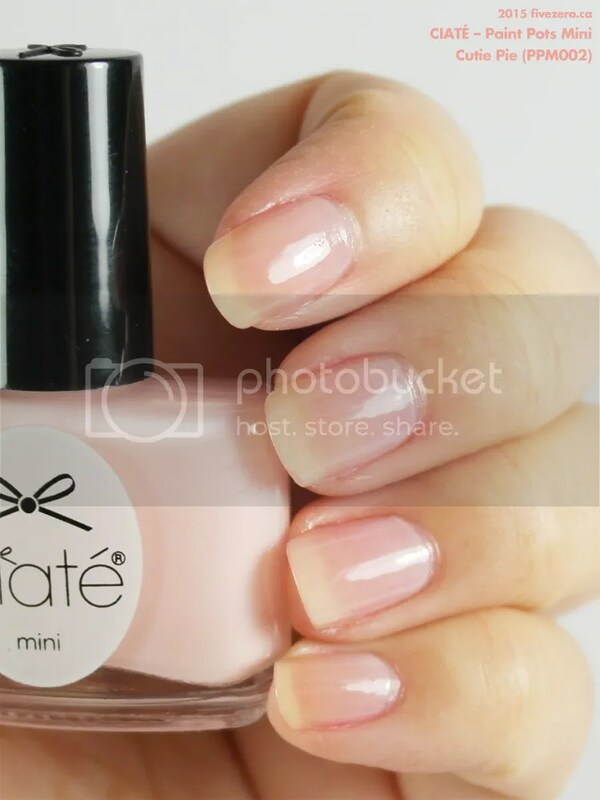 This is a sheer baby pink, fairly neutral, touch of milkiness. It applies quite smoothly, though I’ve tried better milky pink sheer before, since this isn’t entirely streak-free. It dries to a nice, glossy shine. I used three coats in the swatch. I haven’t had a chance to try any of the nail treatments. 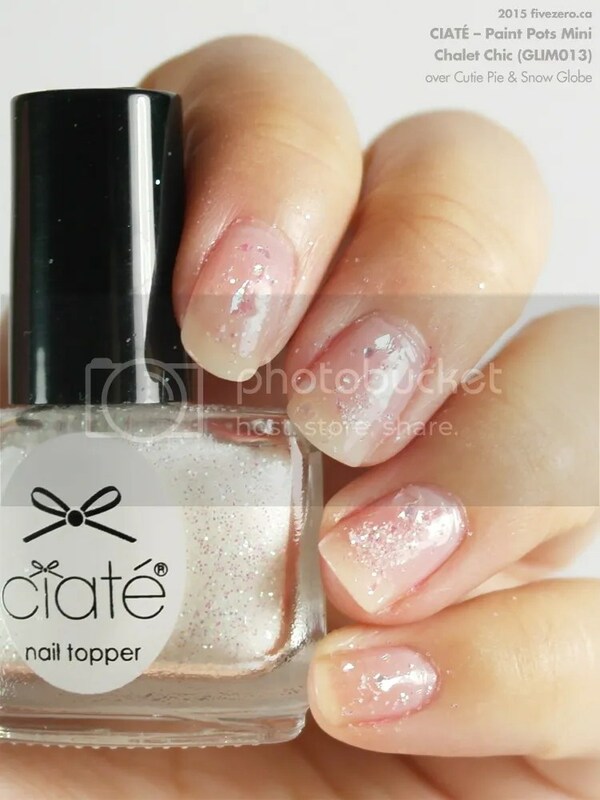 This is a holo flake topper. The gorgeous, silvery white holographic flakes are super pretty, but there’s really not enough of them in here. 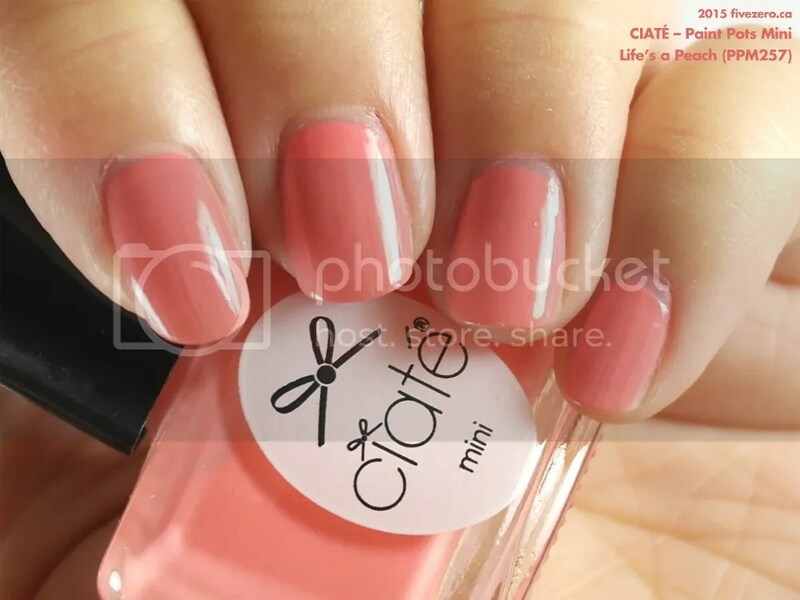 I applied something like three or four coats over what was already three coats of Cutie Pie, and still couldn’t get nice coverage. Blaaaaargh. Am I just not using these top coats correctly?! 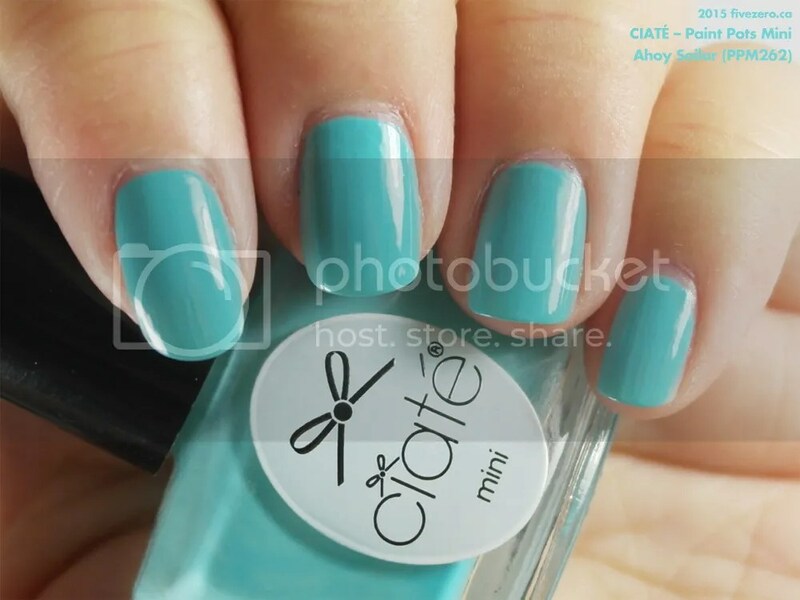 Turquoise blue cream, but required three coats for full and even opacity. I’m not liking the more pastel-ish shades in this set; they all seem to need three coats, and even then, they are a little bit streaky. It’s a shame, because the shades are pretty. This cute li’l file isn’t going to usurp my trusty Essie Crystal File anytime soon, but it’s a perfectly good travel size! 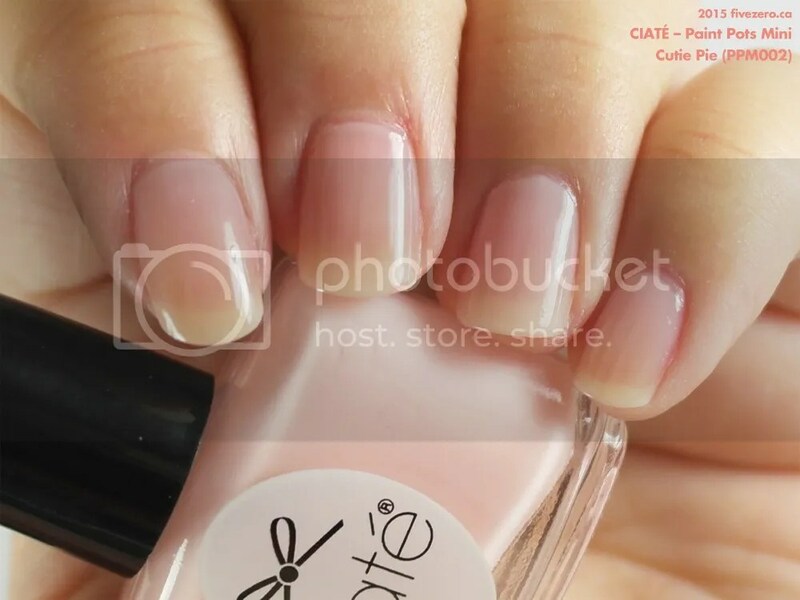 I tried it and I don’t think it’s quite as fine as my Essie, but it’s superior to the Swissco glass file that I also own. 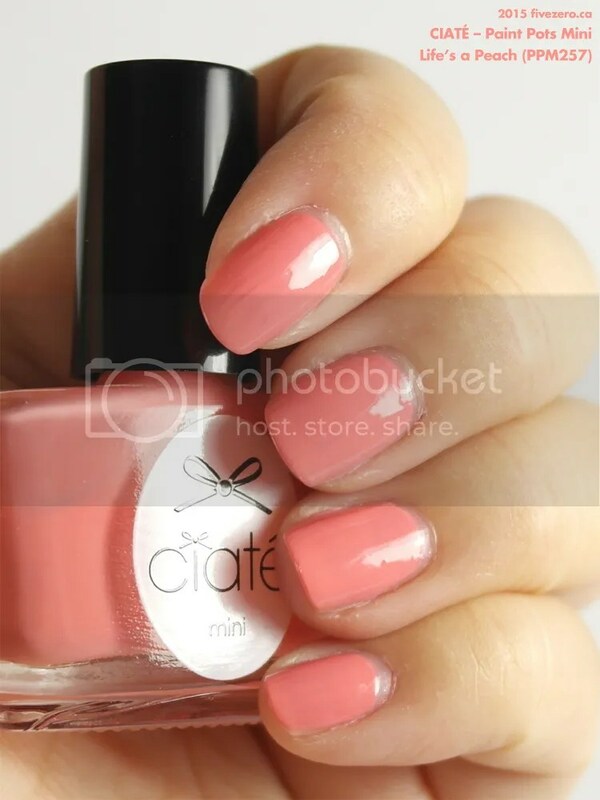 Cute pastel peach cream, but required three coats for full and even opacity. 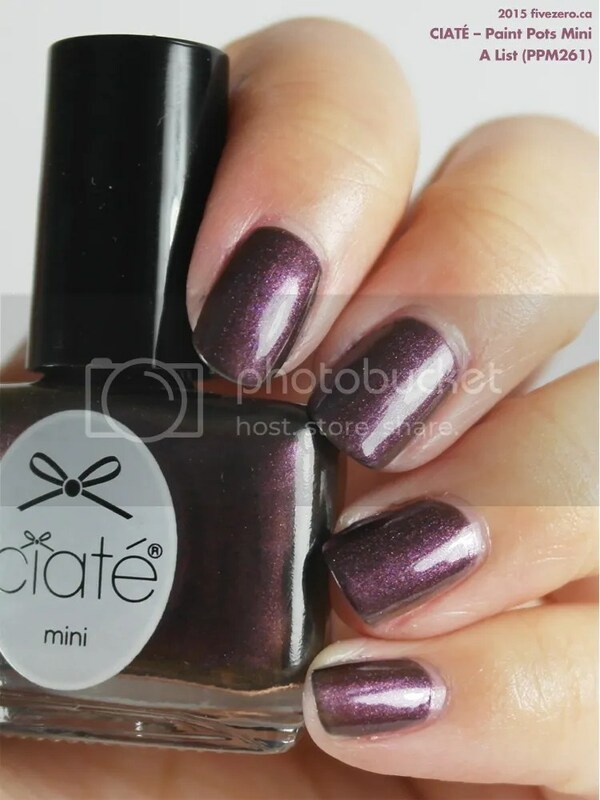 A List is a deep burgundy shimmer with an old gold iridescence that is a bit sheer, so it requires three coats for full opacity. 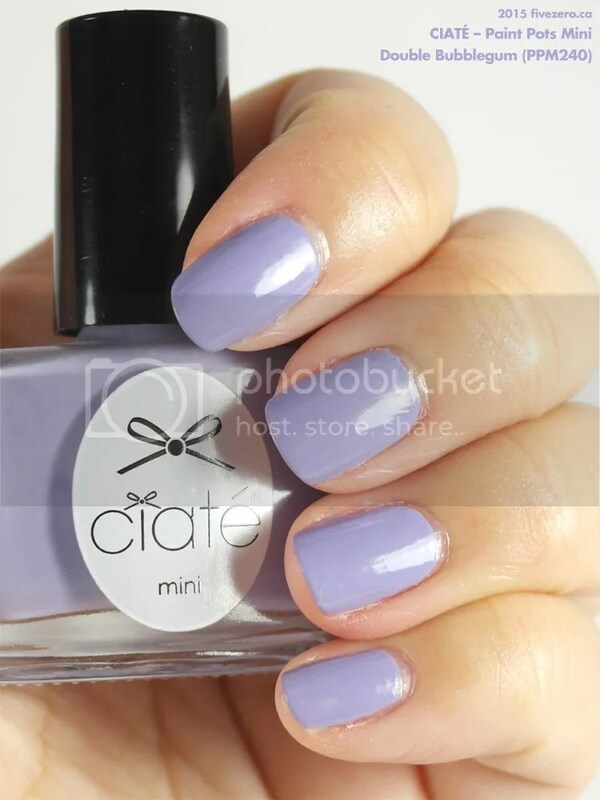 Pretty pastel lilac cream with a slightly grey undertone, but required three coats for full and even opacity. Oddly enough, this is one of my favorites from this bunch! It’s a cool, reddish fuchsia. 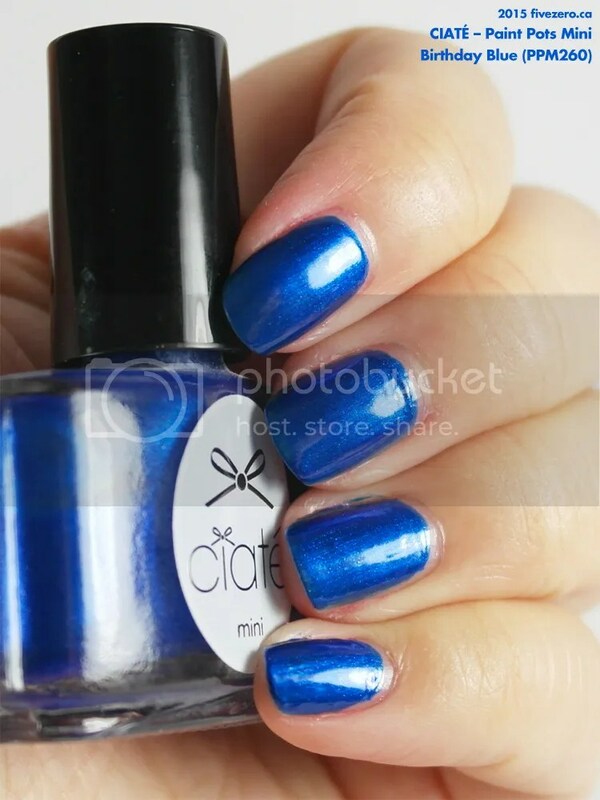 Two coats for full opacity, and it applies very nicely. Part 2 will be posted sometime around/after Christmas! 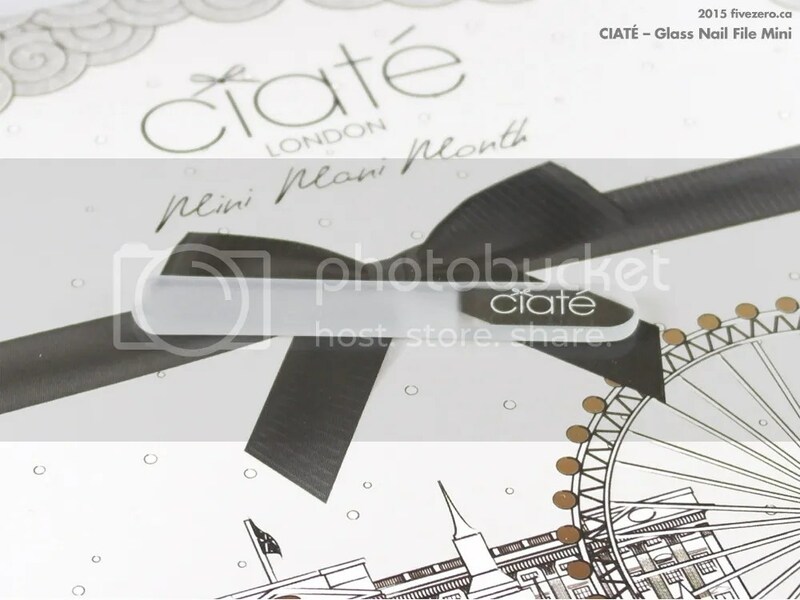 The Ciaté Mini Mani Month 2015 retails for GBP£49 / CAD$71. 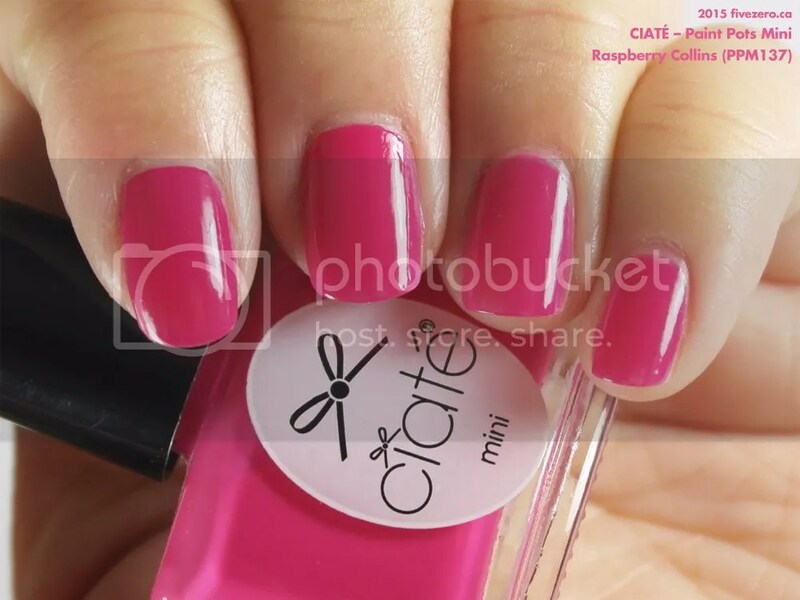 Ciaté Paint Pots retail for GB£9 / US$15 / CA$15 and are 0.46 US fl oz / 13.5 mL. They are free of toluene, formaldehyde, formaldehyde resin, dibutyl phthalate (DBP), and camphor. 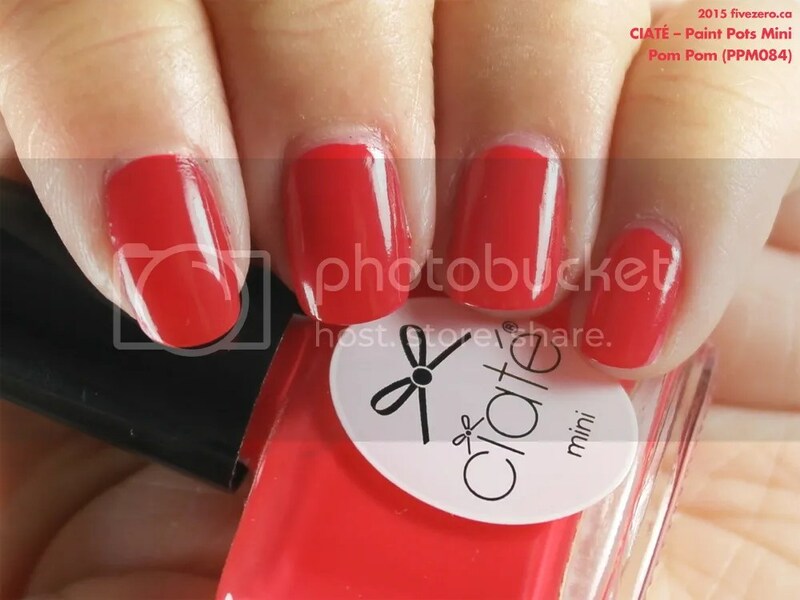 The polish is made in the UK. 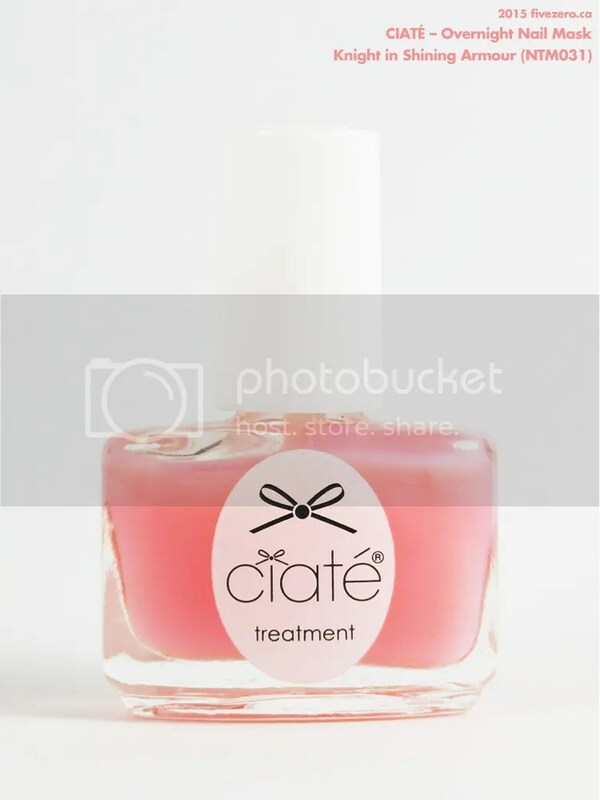 Ciaté was founded in 2012 by celebrity manicurist Charlotte Knight. It is based in London, England. That one is definitely one of the nicest ones! 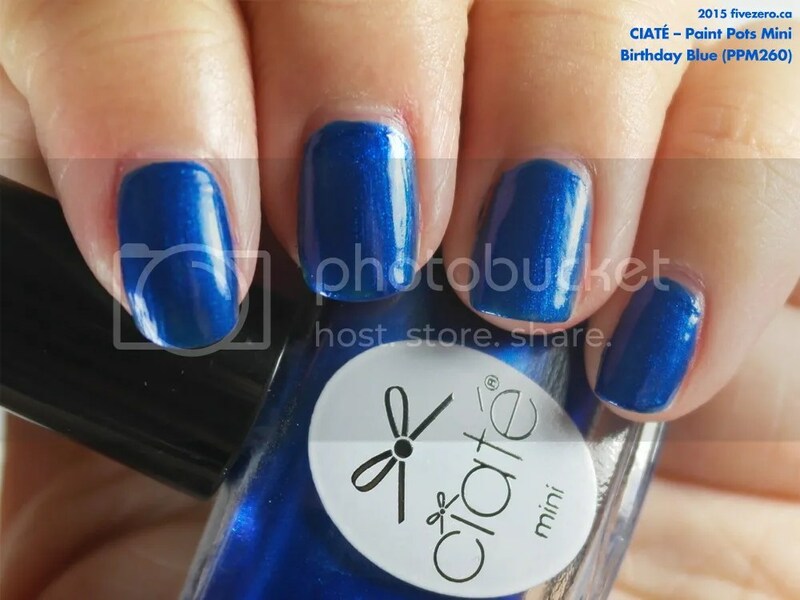 3 coats for most of them-I don’t own any Ciaté polishes..but now i’m curious if the full sized bottles are the same way!? Heirloom is so disappointing – it looks so gorgeous in the bottle – it’d be so nice for layering! 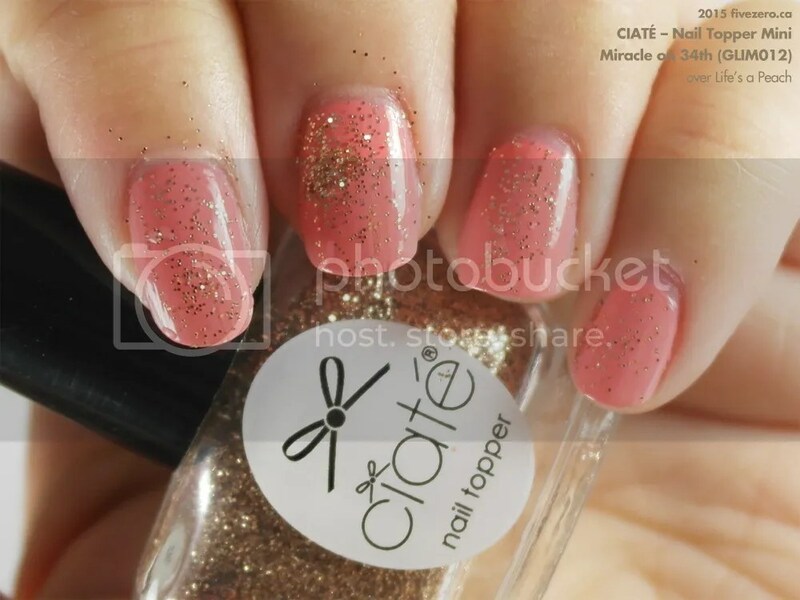 I hate confetti polishes like Check Mate and Snow Globe! Always so annoying to apply evenly – ALWAYS! Is it me or were all the cremes really streaky? Oh this is such a lovely calender. And most of them are very pretty making it tricky to choose. I would have loved the black and white squares, if only they had been dispersed better. It’s a really fun set, and despite a few complaints, I’ve loved going through the shades! I just wish I was better at applying the loose glitters and the toppers! Haha! Nobody is good at that right?! It always turns into such a mess, especially the loose glitters. 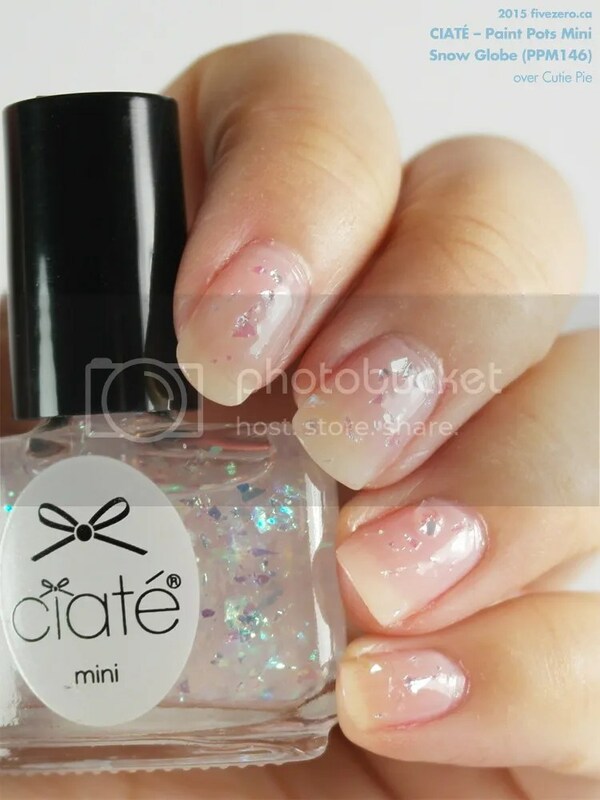 Snow globe looks really awesome – like a winter wonderland on your nails. I LOVEEEEEE Heirloom! And I meant to type Chalet Chic above, not Snow Globe!